Excitatory amino acid release and subsequent biochemical cascades following traumatic brain injury (TBI) have been well documented, especially glutamate-related excitotoxicity. The effects of TBI on the essential functions of inhibitory GABA-A receptors, however, are poorly understood. We used Western blot procedures to test whether in vivo TBI in rat altered the protein expression of hippocampal GABA-A receptor subunits α1, α2, α3, α5, β3, and γ2 at 3 h, 6 h, 24 h, and 7 days post-injuy. We then used pre-injury injections of MK-801 to block calcium influx through the NMDA receptor, diltiazem to block L-type voltage-gated calcium influx, or diazepam to enhance chloride conductance, and re-examined the protein expressions of α1, α2, α3, and γ2, all of which were altered by TBI in the first study and all of which are important constituents in benzodiazepine-sensitive GABA-A receptors. Western blot analysis revealed no injury-induced alterations in protein expression for GABA-A receptor α2 or α5 subunits at any time point post-injury. Significant time-dependent changes in α1, α3, β3, and γ2 protein expression. The pattern of alterations to GABA-A subunits was nearly identical after diltiazem and diazepam treatment, and MK-801 normalized expression of all subunits 24 hours post-TBI. These studies are the first to demonstrate that GABA-A receptor subunit expression is altered by TBI in vivo, and these alterations may be driven by calcium-mediated cascades in hippocampal neurons. Changes in GABA-A receptors in the hippocampus after TBI may have far-reaching consequences considering their essential importance in maintaining inhibitory balance and their extensive impact on neuronal function. Traumatic brain injury (TBI) disrupts neuronal ionic balance and is known to produce glutamate-mediated neurotoxicity [1–3]. Glutamate related activation of N-methyl-D-aspartate (NMDA) receptors and the resulting elevations in intracellular calcium concentration ([Ca2+]i) are important components in synaptic and cellular degeneration and dysfunction after both in vivo[1, 4, 5] and in vitro neuronal injury [6–8]. Disruption of calcium (Ca2+) homeostasis after TBI has been implicated in a wide range of intracellular changes in gene expression, signaling pathways, enzymatic activation and even cellular death [see  for review]. Voltage gated calcium channels (VGCCs) also contribute to the increases in [Ca2+]i identified in glutamate related neurotoxicity due to TBI . Although glutamate-related neurotoxic mechanisms after TBI have been studied extensively, relatively little is understood about inhibitory changes and the role of GABA receptors. Normal neuronal function relies on the constant orchestration and integration of excitatory and inhibitory potentials. GABA-A receptors (GABAAR) mediate the majority of inhibitory neurotransmission in the central nervous system by ligand gating of fast-acting chloride (Cl-) channels . The impact of TBI on GABAAR is poorly understood even though changes in the composition and function of these receptors may have extensive consequences after injury. The few available studies of GABAAR after TBI have resulted in an incomplete understanding of their contribution to injury-induced pathology, but have indicated that the receptor is affected by injury. Sihver et al. found a decrease in GABAAR binding potential in the traumatized cortex and underlying hippocampus acutely (2 h) following lateral fluid percussion injury (FPI). Suppression of long term potentiation in the hippocampus has been demonstrated as early as 4 hours post-injury , although long term depression in the CA1 was not affected, and an overall hypoexcitation has been noted in early measures after TBI . Contrary to the reduced inhibition in CA1 pyramidal cells  and CA3 to CA1 pathway  of the hippocampus, dentate gyrus granule cells  and the entorhinal cortex to dentate gyrus pathway demonstrated enhanced inhibition 2-15 days after fluid percussion TBI in rats . Reeves et al. also noted that GABA immunoreactivity increased in the dentate gyrus and decreased in the CA1 two days after injury, correlating qualitatively with regional inhibitory changes. It is currently unknown whether changes in constituent GABAAR subtypes coincide with these functional changes in hippocampal inhibition. GABAAR can be altered by changes in [Ca2+]i, indicating that the receptors are likely to be affected by glutamate-related excitotoxic effects of TBI. Specifically, Stelzer and Shi  found that NMDA and glutamate altered GABAAR currents in acutely isolated hippocampal cells, and this effect was dependent on the presence of Ca2+. Additionally, Matthews et al. found the NMDA receptor antagonist MK-801 decreased GABAAR -mediated Cl- uptake in the hippocampus. Lee et al. found that the N-type VGCC blocker SNX-185 reduced the number of degenerating neurons when injected in the hippocampus following injury. Also, diltiazem, an FDA approved L-type VGCC antagonist, was discovered to be neuroprotective for cell culture retinal neurons when administered prior to injury . Diltiazem and MK-801 were found to have synergistic effects, protecting against hypoxia-induced neural damage in rat hippocampal slices . Also connecting [Ca2+]i and GABAAR function, Kao et al. found that stretch injury of cultured cortical neurons resulted in increased Cl- currents. These changes were blocked when an NMDA antagonist or a calcium/calmodulin protein kinase II (CaMKII) inhibitor were present in culture. CaMKII is known to be activated by increases in [Ca2+]i and is also known to phosphorylate GABAAR . Kao et al. suggested that injury-induced increases in glutamate activated NMDA receptors, increasing [Ca2+]i and subsequently activating CaMKII, resulting in altered GABAAR function due to phosphorylation of receptor proteins. Although there is in vitro and indirect evidence that the GABAAR is altered by TBI, there are no in vivo studies identifying specific changes in GABAAR proteins. GABAAR typically form a pentameric structure consisting of five protein subunits surrounding a central Cl- conducting ion pore. Although at least 16 subunits have been identified, along with several splice variants of the subunits, the most abundant subunits in the brain typically form a limited number of receptor combinations . Reportedly, the following subunits combine to form nearly 80% of the GABAAR combinations in the rat brain: α1-3, β2-3, and γ2 [23–25], with α1β2γ2 and α2β2/3γ2 being the most abundant subunit combinations. The current study utilized the in vivo FPI model to demonstrate that GABAAR subunit proteins are altered in the rat hippocampus after TBI. Expression of α1, α2, α3, α5, β3, and γ2 were measured by Western blot analysis 3 hours, 6 hours, 24 hours, and 7 days post-injury. These subunits are components in most of the GABAAR found in the hippocampus, and were chosen based on their relative abundance and their potentially important contributions in GABAAR function. When the expression of these proteins changed differentially due to TBI, the time point of greatest change for the greatest number of subunits (24 h) was chosen for pharmacological manipulation. The NMDA receptor antagonist MK-801, the L-type VGCC antagonist diltiazem, or the GABAAR agonist diazepam (DZ), was given prior to FPI to block Ca2+ influx or enhance Cl- conductance. While MK-801 normalized all subunits measured 24 hours post-TBI, diltiazem and DZ were nearly identical in their impacts on the expression of GABAAR subunits. Adult male Sprague-Dawley rats weighing approximately 320-340 g were used for all experiments (Harlan Laboratories; Indianapolis, IN). Animals were housed individually in a vivarium in shoebox-type cages on a 12:12 hour light/dark cycle. Animals in Study 1 were randomly assigned to either the sham or injured condition and to one of the following survival time points: 3 h, 6 h, 24 h, or 7 days (n = 3-4 per group, N = 32). Bilateral hippocampal tissue from each animal was used to analyze expression of all subunits. In Study 2, animals were randomly assigned to either sham or injured with a 24 hour survival time for each of the following treatments: no drug, MK-801 (Sigma-Aldrich), diltiazem (Henry Schein Veterinary), or DZ (Henry Schein) (n = 3-5 per group; N = 33). Animal care and experimental procedures were in accordance with the National Institute of Health Guide for the Care and Use of Laboratory Animals and the protocol was approved by the Institutional Animal Care and Use Committee at Creighton University, where the primary and secondary authors were both affiliated at the time of data collection. Animals were surgically prepared under sodium pentobarbital (48 mg/kg) 24 hours prior to injury, supplemented as needed with 1-3% isoflurane in a carrier gas of 70% N2O and 30% O2 to maintain the surgical plane. Animals were placed in a stereotaxic frame and a sagittal incision was made on the scalp. A craniotomy hole was drilled over the central suture, midway between bregma and lambda. Burr holes held two copper screws (56 × 6 mm) 1 mm rostral to bregma and 1 mm caudal to lambda. A modified Leur-Loc syringe hub (2.6 mm interior diameter) was placed over the exposed dura and sealed with cyanoacrylate adhesive. Dental acrylic was applied over the entire device to secure the hub to the skull (leaving the hub accessible). The incision was sutured and betadine and 1% lidocaine jelly (Henry Schein Animal Health) were applied to the wound. Animals were kept warm and continuously monitored until they fully recovered from the anesthesia. A central (diffuse) injury was delivered twenty-four hours following the surgical preparation by a FPI device described in detail by Dixon et al., . The FPI model in animals has been documented as the most common model of TBI , and the central injury was chosen as a diffuse option so bilateral hippocampi were equivalently injured. FPI in rats produces unconsciousness, cell damage to the vulnerable cortices and hippocampi, ionic cellular imbalance, excitotoxic cascades, blood flow changes, motor and memory deficits, and graded severity-dependent deficits consistent with human TBI [28, 29]. Animals were anesthetized under 3.5% isoflurane in a carrier gas consisting of 70% N2O and 30% O2. The surgical incision was re-opened and the animals were connected to the fluid percussion device. Animals in the injury groups received a moderate fluid pulse (2.1 +/- 1 atm). Sham animals were attached to the injury device but no fluid pulse was delivered. The incision was sutured and betadine applied. Neurological assessments including tail, cornea, and righting reflexes were evaluated. The animals were closely monitored until they had sufficiently recovered and were then transferred back to the vivarium where food and water were available ad libitum. Animals were anesthetized under 3.5% isoflurane in a carrier gas of 70% N2O and 30% O2 at the time point indicated by the study design. The rats were quickly decapitated and bilateral hippocampi were dissected away on ice. The hippocampi were weighed and homogenized with a motorized homogenizer in a buffer consisting of 3 ml RIPA lysis buffer (US Biological; Swampscott, MA) and 30 μl Complete cocktail protease inhibitor (Roche Molecular Biochemicals; Mannheim, Germany) per gram of tissue. The Western blot procedure was adapted from Kirkegaard & Perry Laboratories, Inc. (KPL; Gaithersburg, MD). Following homogenization, the hippocampi were centrifuged at 10,000 × g for 10 minutes. The supernatant was removed and spun a second time at 10,000 × g for 10 minutes. Aliquots of 10 μl of lysate (the supernatant) were stored at -20°C until used. Following a BSA micro assay (Pierce, Rockford, IL) and spectrophotometry to assess protein levels, all treatment groups were run concurrently. Electrophoresis materials (e.g., gels, buffers, membranes) were Invitrogen's NuPage products (Carlsbad, CA), unless otherwise specified. All primary antibodies were polyclonal, purchased from Abcam Inc. (Cambridge, MA), and chemiluminescent reagents were purchased from KPL. Proteins were separated on pre-cast 4-12% Bis-Tris mini-gels using MOPS running buffer in the Novex Mini-Cell electrophoresis system. Separated proteins were then transferred to a nitrocellulose membrane (90 min at 30 V). Standard weights were run alongside each condition, including negative controls. Negative controls consisting of a lane that received all treatments, minus primary antibody, were included on all blots. Following transfer, the gel was stained with Coomassie FluorOrange (Invitrogen) to verify complete transfer to the membrane. Western blots were run using the KPL LumiGLO Reserve Chemiluminescence Kit. Primary antibody concentrations were empirically determined as follows: α1 = 1:500, α2 = 1:200, α3 = 1:150, β3 = 1:175, γ2 = 1:300. Several exposure times, ranging from 5 sec to 5 min were tested to determine the clearest visualization. Digital images were scanned and saved from the developed films. Following immunoblotting, membranes were stained with SYPRO Ruby stain (Sigma Aldrich, St. Louis MO) to ensure even loading of proteins across lanes. No protein bands were visible on any blots run under minus primary conditions. Gel staining following protein transfer indicated that proteins were transferred equivalently across lanes. Blots revealing uneven distribution of protein were excluded from the studies. All drugs were administered 15 minutes prior to TBI. NMDA-mediated Ca2+ influx was blocked by administration of 0.3 mg/kg MK-801 (Tocris; Ellisville, MO) in saline solution. This dose was previously shown to be protective against motor deficits  and cognitive deficits following fluid percussion TBI alone  or in combination with secondary bilateral entorhinal cortex lesions . Ca2+ influx through L-type VGCCs was blocked with 5 mg/kg diltiazem, an FDA-approved drug specific to L-type channels. Chloride conduction through the GABAAR was enhanced using 5 mg/kg DZ, a pretreatment dose previously shown to be neuroprotective against cognitive deficits after TBI . Protein bands of approximately 60 kDa (α1), 53 kDa (α2), 53 kDa (α3), 51 kDa (α5), 50 kDa (β3), and 45 kDa (γ2) were identified and quantified for optical density using IMT i-Solution, Inc. software (Image and Microscope Technology). Due to gel size constraints not all subjects in a group could be run on the same blot, so data were normalized as follows. At least 2 or more sham, untreated lanes were included on all blots. Relative optical density (ROD) of each individual protein band was quantified as a percent difference from the value of the mean sham density for each blot, where the mean sham density was normalized at 100. Therefore, OD measurements for each band in both studies were defined in ROD units, relative to the mean sham OD per blot. Study 1 results from α1, α3, β3, and γ2 subunits were analyzed separately using a 2 (TBI or sham) × 4 (time) factorial ANOVA. For α2 and α5 subunits, the 6 hour time point was excluded based on lack of changes in all other time points, so separate 2 (TBI or sham) × 3 (time) factorial ANOVAs were used for analysis. In order to determine which time point produced the greatest change, a Fisher's LSD post-hoc was used for time point comparisons for each subunit. The results of this analysis indicated that the 24 hour post-injury time point revealed the greatest changes across the most subunits. Therefore, in Study 2 the effects of pre-injury treatment with MK-801, diltiazem, or DZ on protein expression 24 hours following injury were determined using a one-factor ANOVA and Fisher's LSD post-hoc to compare group differences (sham-untreated, sham-treated, injured-untreated, and injured treated) for each of the 3 drug treatments. Due to the relative importance of γ2 and the various α subunits to BZ-type GABAAR pharmacological function, α1, α2, α3, and γ2 were chosen for inclusion in Study 2. All drug treatment groups were run concurrently with untreated sham and injured groups during Western blot procedures to control for variation in group effects. Analyses by ANOVA revealed that recovery of reflexes (corneal blink, tail pinch, righting reflex), measured in minutes, was significantly suppressed in the injured groups compared to the sham groups. All experimental groups demonstrated equivalent injuries as measured by atm and reflex suppression (data not shown). No significant differences were found between sham and injured animals for α2 or α5 relative protein densities at any time point (Figure 1). Expression of α1 ROD in injured hippocampus was significantly higher at 3 hours (M = 129.72) and 6 hours (M = 114.34 and significantly lower at 24 hours (M = 44.23) and 7 days (M = 39.81) compared to sham (M = 100) [F(3,18) = 18.329, p < .001]. Expression of GABA A R Subunits After TBI. 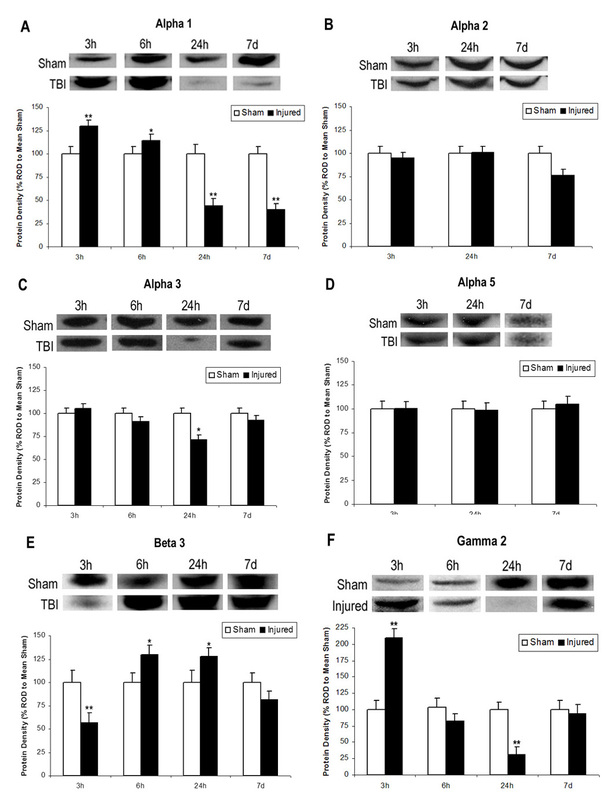 Western blot analysis of GABA-A receptor subunits α1, α2, α3, α5, β3, and γ2 in the hippocampus 3 h, 6 h, 24 h, or 7 days after TBI. Histograms of protein expression were measured in Relative Optical Density (ROD) proportions normalized against the mean sham OD for each individual blot. Asterisks indicate significant differences based on factorial ANOVA; *p < .05, **p < .01. Error bars represent +/-SEM. A: Alpha 1 demonstrated significantly increased expression 3 h and 6 h post-TBI followed by significantly decreased expression at 24 h and 7 days. B: There were no significant differences in Alpha 2. C: Alpha 3 demonstrated significantly decreased expression at 24 h post-TBI only. D: There were no significant differences in Alpha 5. E: Beta 3 demonstrated initially significant decreased expression at 3 h, followed by significantly increased expression at 6 h and 24 h post injury. F: Gamma 2 demonstrated significantly increased expression at 3 h and significantly decreased expression at 24 h post-TBI. Expression of α3 subunit ROD in injured hippocampus was significantly reduced at 24 hours (M = 74.47) compared to sham [F(3,20) = 3.62, p < .05)]. No other time points for α3 were significantly different between injured and sham. Expression of β3 subunit ROD in injured hippocampus was significantly lower at 3 hours (M = 74.97) and significantly higher at 6 hours (M = 114.87) and 24 hours (M = 118.46) compared to sham [F(3,16) = 5.319, p = .01]. There was no difference between injured and sham measures at 7 days post-injury. Expression of γ2 subunit ROD for injured hippocampus was significantly higher at 3 hours (M = 155.03) and significantly lower at 24 hours (M = 69.09) compared to sham [F(3,21) = 15.827, p < .001). There were no differences in γ2 expression between injured and sham at 6 hours or 7 days post-injury. MK-801 pre-injury administration prevented the significant reduction in α1, α3, and γ2 ROD 24 hours post-injury. MK-801 had no significant effect on measures of sham protein expression for α1 or γ2, although it significantly decreased sham α3 expression [F(3,9) = 7.484, p < .01]. MK-801 had no significant effect on α2 expression. Table 1 summarizes significant group changes in protein expression, while Figure 2 presents representative blots and significant changes for each subunit. GABA A R Subunits After pre-TBI Drug Administration. Western blot analysis of GABA-A receptor subunits α1, α2, α3, and γ2 in the hippocampus 24 h post-TBI with either no drug (untreated), MK-801 (NMDA calcium blocker, 0.3 mg/kg), diltiazem (L-type VGCC antagonist, 5 mg/kg), or diazepam (GABA-A agonist, 5 mg/kg). Histograms of protein expression were measured in Relative Optical Density (ROD) proportions normalized against the mean sham OD for each individual blot. Each blot contained at least 2 sham and 1 injured untreated protein lanes. Tissue from the same sham and injured groups was used for comparison to each drug by ANOVA. Asterisks indicate significant differences based on factorial ANOVA; *p < .05, **p < .01. Error bars represent +/-SEM. A: MK-801 normalized alpha 1 expression, while diltiazem and diazepam significantly increased expression in both sham and injured animals. B: No alpha 2 injury effects or drug effects were found for MK-801 or diltiazem, although diazepam significantly increased alpha 2 expression in both sham and injured animals. C: MK-801 significantly decreased alpha 3 expression in sham but not injured animals, while diltiazem and diazepam significantly decreased expression in both sham and injured animals. D: Gamma 2 expression was normalized by all drug treatments. Double arrows indicate a drug-induced significant change beyond effects due to TBI only (i.e, compared to the injured untreated group). DZ and Diltiazem treatment had identical patterns of significance for all subunits except α2, which had significantly increased expression due to DZ treatment. MK-801 normalized all TBI-induced significant changes in protein expression. Diltiazem not only prevented the significant decrease in α1 ROD at 24 hours post-injury, but significantly increased α1 expression in both injured (M = 162.67) and sham (M = 133.90) compared to untreated sham [F(3,8) = 11.364, p < .01], indicating diltiazem significantly increased α1 expression, regardless of injury condition. Diltiazem significantly decreased α3 ROD in both injured (M = 30.48) and sham (M = 27.38), beyond the significant decrease seen in untreated injured hippocampus (M = 74.93) [F(3,9) = 34.13, p < .001], indicating diltiazem significantly decreased α3 expression, regardless of injury condition. Diltiazem normalized the significant decrease in γ2 expression due to injury, but had no effect on γ2 in sham hippocampus. Diltiazem had no significant effect on α2 expression. The effects of DZ on α1, α3, and γ2 expression were the same as the effects of diltiazem on these subunits. DZ significantly increased both sham (M = 193.48) and injured (M = 207.19) α1 ROD 24 hours post-injury [F(3,8) = 19.624, p < .001], indicating DZ significantly increased α1 expression, regardless of injury condition. DZ also significantly reduced α3 ROD in both sham (M = 65.65) and injured (M = 50.93) hippocampus beyond the injury-induced decrease in expression (M = 74.93) [F(3,9) = 14.907, p < .01], indicating DZ decreased α3 expression, regardless of injury condition. DZ normalized γ2 injury-induced decreases in ROD without significantly effecting sham γ2 expression. DZ had the unique effect of significantly increasing α2 expression in both sham (M = 249.62) and injured (M = 252.89) hippocampal tissue, indicating DZ significantly increased α2 expression, even though there was no injury effect on this subunit. The hypothesis that TBI would differentially alter GABAAR subunit expression in the hippocampus in a time-dependent manner was supported. Both α1 and γ2 subunit expression increased acutely after injury, but were significantly decreased by 24 h, while α3 and β3 showed time-specific transient changes and α2 and α5 subunits were not altered significantly at any time point. MK-801 prevented changes to all subunits studied 24 hours after TBI, while diltiazem and DZ treatments had nearly identical effects, normalizing γ2 and altering α1 and α3 expression. 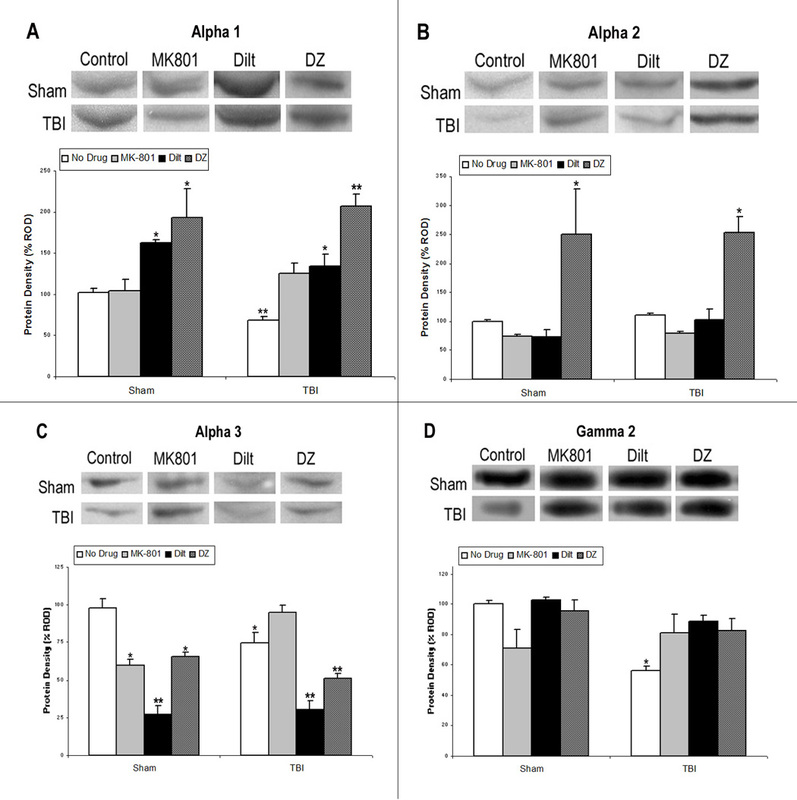 DZ also significantly increased α2 expression in both sham and injured animals. This study is the first to demonstrate time-dependent in vivo GABAAR protein expression changes due to TBI. Most predominant GABA-A subunits have been identified as having specific physiological relevance, often through the use of knockout and knockdown animals. Differential changes in subunits may have important relevance since GABAAR subunits regulate different functions. The β subunit of the GABAAR is vital for the regulation of ion selectivity and general properties of the chloride channel [33, 34], as evidenced by β3 knockout mice developing epilepsy, a disorder associated with a disruption in the ionic balance in the cells . The β subunits also differentially regulate inhibitory Cl- flow . The transitory increase in β3 expression at 3 hours and decrease at 6 and 24 hours post-injury may be related to time-dependent alterations in inhibitory functioning, although further measures of other β subunits and their influence on inhibitory function are still needed. The γ subunit differentially regulates benzodiazepine (BZ) sensitivity with γ2 knockdown mice showing reduced BZ binding  and γ1 and γ3 not demonstrating any BZ activity . The γ2 subunit is also endogenously required for the clustering of receptors at the synapse . Therefore, the initial increase in γ2 expression 3 hours post-TBI, followed by a decrease at 24 hours may indicate greater γ2-containing GABAAR clustering and greater BZ binding potential during the first few hours after injury, therefore providing a widow of initial therapeutic sensitivity for BZ treatment post-TBI. The α subunit of the GABAAR is important for post-synaptic signaling of the receptors  and specific effects of BZs such as DZ . Additionally, the various α subunits have a wide range of unique functions. Constrained mainly to hippocampal neurons, α5 regulates hippocampal dendritic pyramidal inhibition related to learning and memory plasticity . Since hippocampally-driven deficits in learning and memory are well demonstrated after TBI, it is important to note that α5 subunit expression did not change at any time point studied. This may indicate relative stability of this subunit, or the changes may be regionally specific and therefore not detected in the whole hippocampal homogenate used in this study. The α3 subunit contributes to GABAergic inhibition of dopamine neurons, and genetic ablation of α3 subunits is found to cause disruptions in sensory gating as measured through pre-pulse inhibition of acoustic startle . Since decreases in α3 were found only at the 24 hour time point, this may indicate a time-dependent fluctuation in GABA-dopamine interaction during the shift from acute to chronic post-injury measurements. Found mainly in the amygdala, α2 exerts some control over emotional functioning , which may help explain its anxiolytic role in BZ action . Additionally, the α2 subunit is highly expressed in the ventral hippocampus which has been found to exert weaker inhibitory tone and has higher seizure susceptibility compared to the dorsal hippocampus, which primarily expresses α1 . This study focused on mild/moderate TBI and no post-injury seizure activity was detected, which may partially explain why α2 expression was unaffected. However, deficits in excitatory/inhibitory balances in neurotransmission in the hippocampus have been found even in mild TBI, and were believed to contribute to both increased seizure susceptibility and cognitive deficits . The most widespread α subunit with the most diversely documented functional implications is α1, which is highly expressed in the dorsal hippocampus where it likely contributes to greater GABA binding and lower seizure susceptibility . Also, α1 plays an important role in development , so changes in α1 subunit levels may be indicative of a partial reversion of certain GABAergic receptors to a more developmental state. This is an intriguing possibility since GABA activity can be excitatory during development . Excitatory GABAergic signaling has already been proposed as a contributor to the pathophysiology of epilepsy . Persistent alterations in inhibitory balance after TBI have been implicated in increased post-injury development of epilepsy [43, 47, 48] and in cognitive memory deficits [43, 49, 15]. Just as different subunits have unique effects on GABA-A function, their differential alteration following TBI can have specific implications for the pathophysiological state of the recovering brain. Thompson et al. demonstrated differential mRNA changes for GABAAR subunits in cultured cerebellar granule cells exposed to protein kinase A. Protein kinase A inhibitors prevented these effects on α1 but not on α6, indicating differential regulatory mechanisms for different subunits. Epilepsy research has also demonstrated disparate alterations in subunits. Although β3 mRNA decreased in the hippocampus following kainic acid-induced seizures, α1 mRNA increased in the interneurons of the dentate gyrus and CA3 . Huopaniemi et al. demonstrated more than 130 transcriptional changes in α2, α3, and α5 in α1 point-mutated mice after a single DZ injection, although there was no effect in wild type mice. Therefore, in the absence of specific α1 genes, other α subunit transcripts changed, indicating a complicated compensatory relationship among α subunits . The α1 subunit was the only one to demonstrate significant changes at every time point studied. This is important because α1 may mediate apoptosis via the endoplasmic reticulum (ER) stress pathway . Since the cells in the current study were lysed to obtain whole protein measures, regional specificity of each protein cannot be determined and therefore the changes may also represent subunits in the ER. Overexpression of α1 may be related to apoptotic processes after TBI. Also, α1 overexpression can trigger apoptosis due to a complicated relationship with c-myc, a proto-oncogene that regulates cellular proliferation and apoptosis. The α1 gene is a direct target for suppression by c-myc and mRNA expression is inversely related to c-myc expression. This inverse balance between c-myc and α1 may be either a marker or a key player in the developmental cessation of neuronal pruning. Shifts in c-myc expression during neuronal insult such as TBI may result in changes to the α1 gene, independent of its role in GABAAR function. Over-expression of α1 has also been associated with apoptosis in a Ca2+-dependent manner. Specifically, disruption of ER Ca2+ balance may alter α1 mRNA, producing an increase that activates caspase 3 and induces apoptosis . Therefore, blocking Ca2+ influx due to TBI may prevent α1-associated apoptosis by preventing significant increases in α1 subunit proteins. Alterations in α1 expression may also affect the function of the GABAAR. Increases in α1 mRNA and protein expression during development correspond to increases in BZ binding and altered zinc sensitivity , while reduced α1 mRNA and protein expression in the hippocampus of seizure-prone animals is associated with reduced inhibitory tone . Increased α1 subunits may also contribute to pronounced sedative or amnesic effects associated with BZs without any effect on the anxiolytic or relaxant properties [56, 57]. Since changes in α1 protein expression were different during acute (3 h, 6 h) and chronic (24 h, 7 day) post-injury time points, there may be important implications for the timing of BZ use in TBI patients. O'Dell and Hamm  found that DZ administered around the time of injury significantly improved mortality and cognitive outcome in a water maze task 2 weeks after FPI. However, chronic treatment with Suritozole, a negative GABAAR modulator similar to BZ inverse agonists, starting 24 hours post injury was also cognitively beneficial in the water maze . Increased α1 and γ2 within 3 hours of TBI in this study may indicate a shift in GABAAR constituent proteins to a more BZ-sensitive composition. This could prime GABAAR for greater sensitivity to BZs and increased Cl- conductance, while the decrease in α1 and γ2 at 24 hours may be an attempt to compensate for chronic hypofunctioning by reducing GABAAR sensitivity. Novel compounds that target specific subtypes or subunits of GABAAR may provide more insight into their roles after TBI. Alteration to GABAAR expression may be due to phosphorylation of subunit proteins. Increases in glutamate after injury trigger VGCC and NMDA receptors, increasing [Ca2+]i, and resulting in activation of CaMKII. A single dose of DZ can downregulate CaMKIIα transcription quickly and persistently, although this downregulation of CaMKIIα transcripts in wild type mice is not found in mice with point mutations to GABAAR α1 . Folkerts et al. found that fluid percussion TBI increased both CaMKIIα and total CaMKII in the hippocampus, although this increase was transient with CaMKII elevations no longer significant by 3 hours post-injury. Protein phosphatases such as calcineurin also increase after TBI due to activation by elevated [Ca2+]i. Folkerts et al. proposed protein phosphatase activation, including calcineurin, may explain the unusual pattern of CaMKII immunostaining in CA3 pyramidal cells in the hippocampus after TBI. A single pre-injury injection of MK-801 normalized GABAAR subunit expression. Therefore, blockade of Ca2+ influx through the NMDA receptor effectively attenuated α1, α3, and γ2 subunit decreases 24 hours post-injury, indicating that injury-related influx of Ca2+ through the NMDA receptor contributed to the changes in GABA-A subunit expression. There may be diverse regulatory mechanisms involved in the interaction between NMDA receptors and GABAAR. Kim et al. found chronic blockade of Ca2+ influx through the NMDA receptor with MK-801 reduced β3 and increased β2 mRNA but not protein expression in the hippocampus. Chronic MK-801 treatment did not alter GABA-A α1 or NMDA receptor subunit mRNA or protein expression in the hippocampus but GABAAR-mediated Cl- uptake was still significantly decreased . Although this study was not designed to determine the specific mechanism by which elevated [Ca2+]i resulted in alterations to GABAAR subunits, we do know that elevated [Ca2+]i alters numerous intracellular mechanisms following TBI , including activation of apoptotic factors, CaMKII, and protein phosphatases. Although Ca2+ influx through the NMDA receptor is a major source of neuronal excitotoxicity , other sources of Ca2+ influx may also be important. For example, VGCC blockers have been shown to be beneficial after TBI [10, 62]. Diltiazem, an L-type VGCC blocker, and DZ, a GABAAR agonist, had statistically identical effects on the expression of GABAAR subunits α1, α3, and γ2, normalizing γ2 and significantly increasing α1 and decreasing α3. Changes to α1 and α3 occurred in both sham and injured animals, indicating drug effects that overrode the injury effects. Some L-type channel blockers have known effects on receptors such as NMDA  or GABA-A , but diltiazem has been shown to have no direct effect on recombinant α1β2γ2 receptors . However, VGCC regulation of GABAAR surface expression may be a common mechanism since it has been implicated after hypoxia  and extended GABA exposure . Therefore, the similar profiles of GABAAR changes for diltiazem and DZ are likely due to similarities of action that alter excitatory/inhibitory balance, rather than a direct effect on the GABAAR. Both diltiazem and DZ inhibit Ca2+ release induced by sodium presence in rat brain mitochondria  by inhibiting mitochondrial Ca2+ efflux via the sodium/calcium exchanger [68, 69]. One method of buffering excessive increases in [Ca2+]i after TBI is to sequester Ca2+ into organelles such as the mitochondria. Calcium, however, can damage the mitochondria, resulting in several detrimental consequences, including the release of pro-apoptotic factors . Through the enhancement of GABA-A Cl- influx, DZ regulates Ca2+ and apoptotic factor release from the mitochondria, providing neuroprotection after in vivo ischemia and in vitro glutamate or oxidative stress in CA1 hippocampal and brain slices, respectively . This DZ regulation of mitochondrial Ca2+ release likely plays an important role in vivo after TBI as well. Diltiazem and MK-801 have synergistic neuroprotection against hypoxia in rat hippocampal slices, beyond simple additive effects . Diltiazem  and MK-801  both reduced excitotoxic effects of glutamate and NMDA exposure in a cell culture model of hypoxia. Although diltiazem did not block NMDA receptors, it was more effective in reducing NMDA-mediated than glutamate-mediated Ca2+ influx, and was more effective at lower doses than MK-801 at regulating glutamate-mediated Ca2+ influx. The effectiveness of diltiazem highlights the importance of non-NMDA sources of intracellular Ca2+ influx. Opening of VGCCs can trigger removal of the NMDA receptor magnesium blockade, with NMDA receptor-mediated influx of Ca2+ further depolarizing VGCCs. Diltiazem, therefore, blocks L-type VGCCs at initial and continuing stages of Ca2+ entry. Due to relative safety and potential benefits, both diltiazem and DZ may have therapeutic potential acutely following TBI, but more information is needed to understand the mechanism of neuroprotection, influence on cascades, and impact on behavioral outcome. Evidence indicates the timing of administration of these drugs will be crucial. The current studies are the first to demonstrate that TBI induces time-dependent changes in GABAAR α1, α3, β3, and γ2, but not α2 or α5 expression during the first 7 days after injury. The changes in GABAAR protein expression found in these studies may have important consequences for post-injury apoptosis in the hippocampus, as well as neuronal excitability and pharmacological responsiveness after TBI. These studies, therefore, support the hypotheses that TBI alters the constituent proteins of the GABAAR and that these alterations may be driven by a calcium-mediated mechanism. This publication was made possible by NIH grant number P20 RR016469 from the INBRE Program of the National Center for Research Resources. CG conceived of the design of the studies, served as PI for grant funding, conducted all surgery and injury procedures, contributed to Western blot procedures, performed all data and statistical analyses, and was primary contributor to the final manuscript. RM contributed to refinement of the design, assisted with all surgical and injury procedures, performed Western blot procedures, and helped draft the manuscript. RH contributed to the initial conception and design. All authors contributed to and approved the final manuscript.